I've always loved Redwoods but I've never actually seen one in the bark so to speak. So I decided to have a go and grow some of my own from seeds using your growing guide. Wish me luck! I planted my 10 coastal and 10 giant redwoods a couple of months ago and to my delight a giant redwood sprouted quite quickly. However it seemed to stop growing, then fell over. There are now 4 redwoods growing in total but I’m worried the first one fell over for some reason it seemed to just go soft. Do you think it could be overwatering? The soil was quite soggy so I emptied the water out of the bottom to reduce that. From your description of the soil being "soggy" and having to tip away the water from the bottom I would say that you are overwatering. This would definitely lead to the problem you describe with the one that died. I sow my seeds in individual pots that fit 15 to a tray (or a segmented tray insert) so that once they have germinated I can water them separately. I water from below (with the pot stood in a saucer), and if there is any water in the tray after a few minutes I will tip it away. Also, I use the weight of the pot as my guide to whether to water, if it feels featherlight then I will water but if it feels a bit "weighty" or if it looks damp on top I will not water. The only problem with the weight method is of course that the dry weight will depend on the compost used; some compost (eg John Innes no1, seed compost) will be heavier because of the greater amount of gritty or soil-based material in the compost. I drained off the excess so as the soil dries a little. The remaining ones will hopefully be ok, they’re nearly ready to repot anyway. I’ve still got one Giant and 2 Coastal so that’s not bad from 20 seeds In total. I’ve been reading up about their habitat conditions in North California where they’re most successful and I think Lancaster is perfect for them. It’s damp sunny foggy and has plenty of valleys with streams. I might see if I can buy a small plot of land to put them in so they can’t be cut down in the future. I lost another one of mine before I realised why, I was leaving the propagator lid on too long and they were suffocating. Not to worry though because I got one Giant Redwood and one Coastal Redwood growing happily in a pot now on the kitchen windowsill. 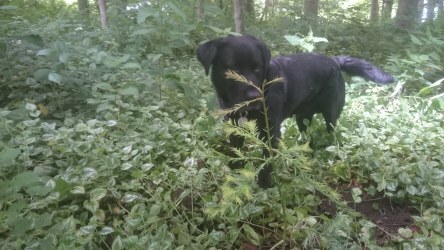 It’s been over a year now and both my redwoods have grown well, however recently I’ve noticed a couple of things and I was hoping I could pick your brains. The Giant Redwood is growing a big bulb on the top rather than growing upwards for some reason, it looks healthy enough but it seems unusual. 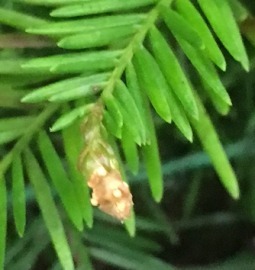 The Coastal Redwood is growing all its shoots from a lump at the bottom and its 3 leads at the top are going brown. I'm pleased to hear that your two Redwoods are still growing well. The Giant Redwood may be growing a cone, without a picture it is difficult to say, perhaps you could send one? 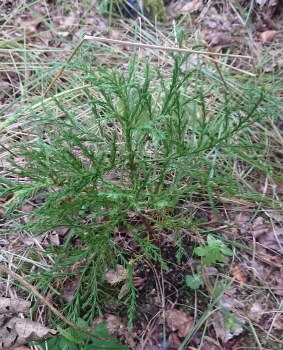 As for the Coastal Redwood, again a picture would be useful but I've found they do often grow shoots from the base, these can be clipped off and used as cuttings to grow into new trees. I wonder whether you're over feeding or under feeding the trees? Have a look through this (Tall Tales) page, there are a number of reasons for redwoods going brown and you may see your problem on there. It could be that during the hot summer it dried out near the bottom of the pot even though the top may have looked very damp. Take heart though because Coasts are survivors and often spring back into life when you're fearing the worst. They are also very quick to grow a new leader if need be. They're doing very well and have some new friends, I purchased some Australian Mountain Ashes which seem to grow much faster but it seemed a shame not to give them something to compete with. The first picture is the weird pineapple growing on top of the Giant Redwood, the second picture is the base of the coastal redwood where all the shoots grow from while to leaders at the top go brown and stop growing. The last picture is them both in the bathroom, I put them there over winter as it was a little colder and damper so I thought they'd like the moisture in the morning form the shower. It's sort of like fog in a way. Well that was my rationale. I spray them sometimes too with a mister. The Coastal one is the one I'm concerned about, it doesn't need repotting looking at the roots but it seems unhappy about something. Yes, you are definitely growing a cone at the top of your Giant Redwood! Personally I would suggest snipping it off but you may want to just let it grow out of curiosity. I'm afraid I have heard that when a very young tree produces cones it is stressed. The Giant won't like being sprayed, particularly indoors and it's possible it might encourage mould growth at that size. 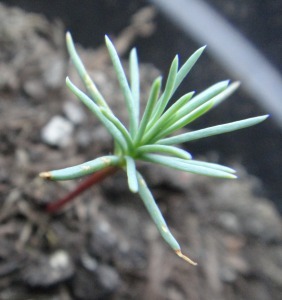 If you snipped off some of the fresh growth from the lower sprouting area of the Coast Redwood and pot them up, you might find these will grow into new plants. Coasts are fairly easy to propagate this way, but ironically these might be best kept in a damp space and sprayed for a few months because they won't have roots. So perhaps you will have some friends in your bathroom after all! It’s been a while, I hope you and your Redwoods are all doing well. Unfortunately mine both died in the end. I’ve learned a lot though and I’m going to have another go. My problem I think was that putting them on a window ledge above the radiator hurt them. I've given it another go with a new batch of seeds and this time they all sprouted! I'm the proud owner of 30 Giant, Dawn and Coastal Redwoods, this time I think I'll put them out for winter but not so soon that they can't survive the slugs. Hopefully that'll allow them to grow in their proper environment. Also they're not in direct sunlight this time. That's good news! I'm really pleased you had another go and have some great results. Coastal, Giant and Dawn Redwoods July 2016 I've attached pictures of my happy redwoods, they're all doing really well. I learned a lot from my mistakes last time. This time I put them outside much earlier to let them get acclimatised and to keep them in the shade a bit longer. Also the wind helps them toughen up a bit. The smaller ones went out last week to join the quicker growing ones... they were beginning to lean towards the window so it was time to put them out. One day I'll have to find a home for them all, where do you plant yours when they become too big? It's great to see all your trees doing well! I tend to keep them in the unheated greenhouse until they are five or six inches tall, although a friend leaves them out all year from two or three inches tall and brings them into a sheltered spot for the winter. It might be worth trying to get a small plastic shelter for the coldest part of the winter if your don't have a heated greenhouse. The main thing is they need to be in a cool place with plenty of ventilation. When the time comes to plant them out (I would recommend potting them on once or twice first, maybe wait until they are a few years old at least), either I try to find someone with some land who wants a tree or I do a rogue planting in a public space. The only thing is I do tend to lose a number of them to vandalism or theft. 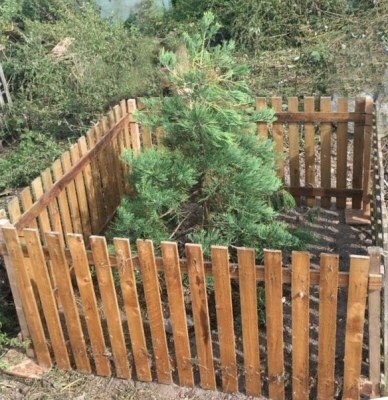 Perhaps you could approach people or organisations (charities/schools/parks/churches) who may have some land and would be very happy to have a Redwood tree or two for free. If it is a public area you can keep an eye on it as it grows. An alternative action would be to locate an appropriate public area and plant them out yourself, avoid areas where vandals make a sport of tree mutilation and obviously plant it away from any underground services or overhead cables etc. Good luck with your trees and let me know how you get on. The winters up north are pretty mild so I think I'll leave them out to toughen up. I lost a giant redwood sadly when my friend didn't water them while I was away but all the Coastal Redwoods are doing great. The mountain ashes it turns out grow much faster than I ever thought. I thought I'd be able to keep them in the yard for another year but they've shot up 4 foot in 4 months! I can see why they give the Coastal Redwoods a run for their money as world's tallest tree. 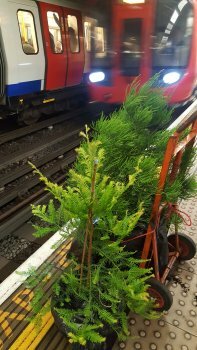 I'll take some picture for you of the redwoods when they get a bit bigger, at the moment they all live on the recycling boxes, I've bunched their pots together so they look like a little forest. Here is a picture of the redwoods in the snow from last Christmas. They're much bigger now and all ready to plant out this month. 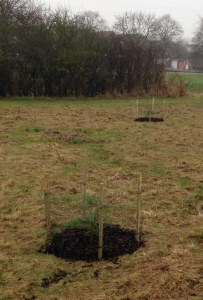 Here are several of Rob's thirteen saplings planted out in the grounds of Lancaster University. Fantastic work Rob! Giant Redwoods on the edge of the lawn Here is some stuff from Dutch big tree lovers. 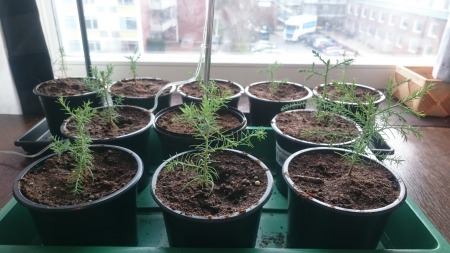 Here in Holland - Assendelft, near the famous windmills of the Zaan area, we are growing sequoias in our garden, and two streets away, a nice row of Dawn Redwood, around ten years old. We visited the Mont Royal in Germany, near Traben Trarbach and there are some beautiful solo standing 120 year old giants, from which I used the seeds from the cones. There is also a little "forest" with some 2 - 3 hundred giant wellingtonias on the mountain. I estimate them at 50-60 years old. It's just nice to know there is a growing army of redwood lovers. It certainly is Jan and thanks for writing to tell us your story of Redwoods. The forest of Wellingtonia sounds terrific, it's a rare thing to see a forest of these in Europe. 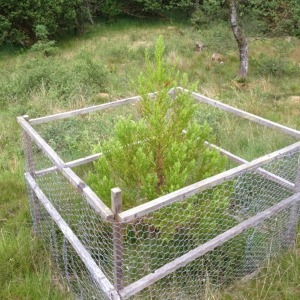 I know of only one such forest, which is in Kilum, Scotland and was spotted by our regular Scottish contributor, Tam. 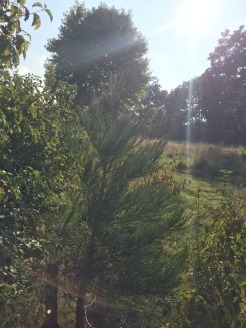 November 2012 I have written to Southend council for permission to plant this tree in one of their parks, and they have given me special permission to plant it in Blenheim park. 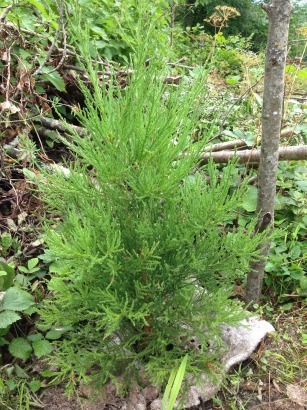 Shem wrote to say that his Giant Redwood was successfully planted a month later, it looks great, I hope it does well. It's great when you see them grow taller than yourself! It's about 5' 9" now and saw about a foot and a half of growth this summer! Thanks for the update Shem, I took a photograph in December, your tree is growing well. 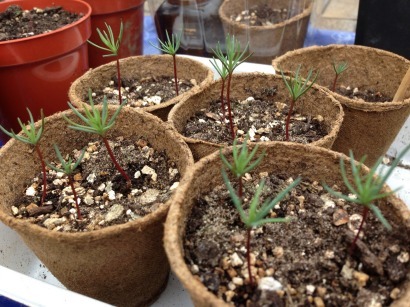 Once you very kindly gave me some small redwood saplings, just like to say I still have some of them. Sorry I haven't reported the progress of the trees to you. Before living in a small garden in Hertfordshire you gave me some plants which I kept in pots for convienence - in Sawbridgeworth near Stansted. A few years ago I moved up to Norfolk and having a larger garden planted them out. But sadly only one is still alive, a Giant type and it is doing well but a little stunted from being in a pot for several years I suppose. I see there are some Dawn Redwoods in Shipdham Churchyard, I'll have to go and look. Also, I regularly go to walk along Thetford Forest by Lynford and so often see the double avenue of redwoods there. I would like to gather some seed from these and try to germinate some but I have always failed before. It's good to hear from you again and I'm glad one of your trees survived and is planted out. They do take a while to get going, but after a few years their growth rate accelerates. 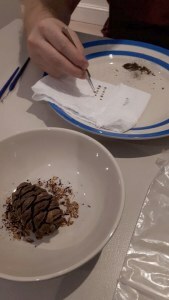 If you do decide to have a go at germinating some of the seeds from any cones you collect, the main thing is not to over-water the seedlings when they have germinated. Our main house is in London but my mother's side of the family come from the French Pyrenees and I myself bought a place down there with some land 7 years ago. The home is at the end of a small village of 80 residents at an altitude of 600m in a sheltered East-West facing valley. The place had been virtually abandoned 45 years ago so was desperately overgrown. 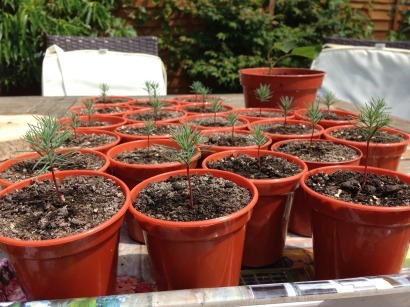 Anyway, have cleared the land over time and whilst down in the Pyrenees in January 2012, I bought 6 x 10cm Sequoiadendron saplings from a French website. Kept them in the barn but it was a very cold time (for the Pyrenees at least) with 10 days -15c overnight and daytime never warmer than -5c. I didn't however want to bring them into the 22c heat of the house as thought the change would shock them more! The pots I had planted the tiny saplings into had frozen soild and within a week or 2 they were all suffering from winter discolouration and all foliage had turned a horrible rusty brown/grey. At that stage I really feared for the worst. At the end of the holiday, I decided to bring them back to London with me to grow them on and by the end of last year the tallest had grown to 55cms whilst the shortest was 44cms and all getting quite root-bound in their 10" pots. I had already moved them from 6" pots in the middle of the summer as the roots had formed a thick mat an inch deep at the bottom of each pot. So from looking nearly dead at the end of Jan 2012 they made a great recovery. Just goes to show how resilient they are but perhaps no surprise considering their natural environment. This January, I took them back to France for planting out in their permanent place. They are planted in 2 rows of 3 at one of the entrances. Whilst clearly it will never be on the scale of the Benmore avenue, I hope it will, in time, they will bear some minor similarity. A dear neighbour in the village has sent some recent photos and it seems that they are happy to be in their permanent position and out of the pots. This season's growth is well underway and from the photos it seems they have all become much thicker and bushier already and also have grown up to 10cms or more. Shall know more when I make a visit at the end of the month. The last time I was down there was in early March and at that time I couldn't really see them as they were all covered in snow. Was a little concerned as the weight of snow had made all the branches sag to completely horizontal but appears to have done no lasting harm based on the recent photos I received. The soil in the valley does seem to be very fertile as everything seems to grow very quickly, and perhaps also due to purer air from the altitude and hence more intense sunshine and regular rainfall when not sunny, you can almost see the other plants and trees I have put in growing by the day. Hopefully the environment has some similarities with the Sierra Nevadas and the sequoia will really settle well and hopefully grow fast and healthily. I also wanted to tell you of my first attempt at growing from seed. Encouraged by your website, I thought I would give it a try. I picked up some brown cones on a walk last summer in Surrey (trying to remember where!) and over couple of days shook out all the seeds I could. In the end I had several hundred seeds and placed them in a bowl in my office to wait for the Spring. I meant to put them in for cold stratification over winter but of course forgot and only remembered to do so upon my return from the March trip to France. I soaked them overnight and then put them in a damp paper kitchen towel folded into 4 inside a sandwich box in the fridge. The intention was to take them out to plant after a month. Initially, on a weekly basis I inspected them and sprayed a little additional water onto the paper towel. Being a little too busy, I forgot about them as the box had been pushed to the back of the fridge. Anyway at the end of May, took them out and noticed several seeds had a small white root perhaps 2-3mm growing out - an indication to me at least that was time to plant them up. So, conscious of your comments about damping off I planted the largest 76 seeds with a mixture of potting compost, vermiculite and additional horticultural sand to make a reasonably free draining mixture. I covered the seeds themselves with a thin dusting of mixture maybe 2mm thick. I also used cardboard pots thinking that if ever I did put too much water, the porous sides would hopefully help the soil to dry quickly rather than plastic pots. The pots were placed in my propagator at 15c (guidance from an RHS book on propagation) and sprayed regularly to keep the top part of the surface slightly damp. Anyway, think I have experienced a large amount of beginners luck as after 2 weeks currently have 32 seeds (over 40%) that have germinated. The earliest ones are just starting to grow their second sets of leaves and all are less than 3cms in height. Was seeking your guidance on various things as naturally, would like to get them past the high mortality phase of the first 2 months that you have referred to. 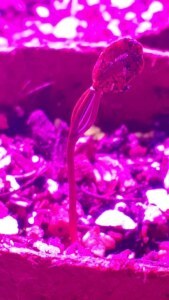 To avoid the damp problem, I am watering them with a pipette from the top (3 or 4 drops to the base of the seedling) with a much diluted soluble food (Chempak 4 and sequestered iron) twice a day or when I feel the pots are starting to get a bit light in weight as you also mention. My wife thinks this is pampering in the extreme and in fairness it is difficult to argue against it. For the moment however, it appears to be working. So at what stage do you think I can water from the base with larger amounts of water and a standard (higher dose) of plant feed? I ask because as they germinated just before the start of summer (late! ), I want to be sure that they gain enough in size this growing season to see them through their first winter. 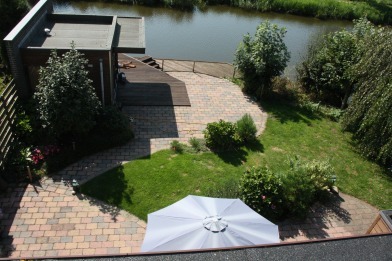 As you can see from the photo, there are pots (quite a few!) where 3 seeds have germinated. I have read your comments about snipping some to ensure the survival of the remainder but wonder since you wrote this piece on the website, have you experimented any further with splitting multiple seedings at an early stage? My feeling is that if I do this, it should be soon before the roots spread too far. Hopefully, as the soil mixture is so free draining, I can separate them without causing too much root damage. Any thoughts or comments? The website states that within a couple of weeks of germination, there should be multiple branches on the seedlings but as mentioned, the majority of mine still have just the cotyledons or very early stage of the second set of leaves. Was your comment more about faster growing Dawn and Coast seedlings? 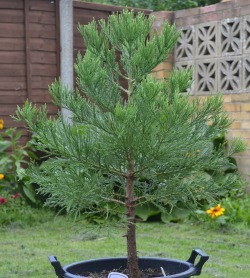 I have found that I have become rather enthusiastic about these sequoia. On the land in the Pyrenees, I have planted 50 or so other trees, including a fair few from the red oak category and they will surely be spectacular in autumn but I keep finding that my thoughts turn to the sequoia and just wish, as I am sure everyone must think, that they went in a hundred years ago. There are just 3 planted within 10 miles that I have seen and they are perhaps 40-45m but this is based purely on the quickest of judgements by eye. I don't know when they were planted, but they do serve as a local inspiration. In case you are wondering what I shall do with the saplings if am lucky enough to get them through the first few months, well am thinking of talking to the local council. In one of the parks they are planting many trees and believe a couple of sequoia planted as sentinels by one of the gates would look tremendous in the future. Would help the council with its carbon capture targets and again in time, be of good educational value for local school visits and hopefully everyone who visits will take the time to stop and admire. 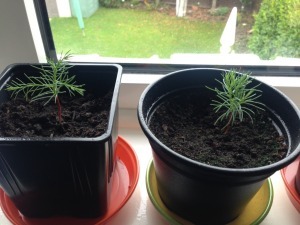 I really enjoyed reading your tale about your Redwood trees and it's good to hear that your six Sequoiadendron saplings survived and you have your own mini Benmore Avenue! As to your seedlings, I would generally be watering from the base once they are an inch or so high, but if I didn't think the root was deep enough or the water wasn't soaking up through the compost I would occasionally put a little water on from the top. I would avoid using a full-strength feed mix while they are young, I would wait until they are six inches or so tall and even then I would only use feed every third or fourth watering. It is just a hunch based on my experience so far. As for the pampering, I think they're worth it! As for separating the multiple seedlings, you could try doing so with a large-ish teaspoon. 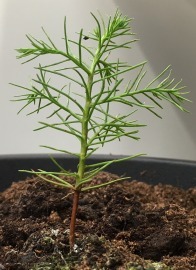 In the early days I sowed my Redwood seeds in a tray of compost and separated them out using the teaspoon method, sometimes one may die but I think it depends how well the compost holds together. Personally I don't like to risk losing them but you could try doing it and minimise the disturbance to the remaining seedling as an experiment and see what happens. Perhaps I was a little over generous with the growth rate of the Giant Redwood but I suspect very soon your seedlings have a cluster of branches. They do seem to be slow to get going but the rate will vary according to weather conditions (i.e. amount of light and the temperature). As you can see from this photo taken a few days back, the seedlings are progressing well with some now having more than 20 leaves (or are they branches at this stage?) which is quite a change from when I wrote to you before my trip to France. From what I can observe, there seems to be the start of a very small trunk growing up from where the main red seedling trunk stops as certainly they are much "bushier" than before. Hopefully the warmer temperatures will start to really bring them on. I am at least pleased (or should that be relieved?) to see some pronounced growth after what appeared to be a period of little activity. 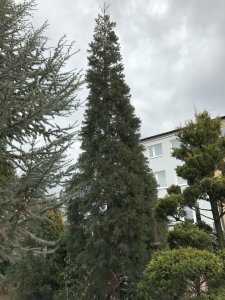 As I mentioned, I had at the end of June a brief visit to our home in the Pyrenees and one of first things that I wanted to see was the progress of the sequoia. Overall am very pleased with the change since my last visit mid-March. They have become much "bushier" or more dense with the trunk all but hidden behind many many new branches that have sprouted. The trunks are also covered with with plenty more tiny emerging shoots and the trunks themselves have thickened considerably. One of the six is in the shade of a soil bank and has grown to a lesser extent. Once it grows above about 80cms, then the top will be in direct sunshine. The remaining five have grown between 30cms and 40cms since March which I was not expecting with the tallest now measuring 86cms though this is not the one that has grown the most. Due to my growing addiction to sequoia, I get perhaps more concerned about things than would ordinarily be the case. Perhaps you have some guidance to offer on the following points. 1/ some of the tips of the branches have died back to a length of 2-3cms and are a dry brown colour. Any opinion as to what this might be and if yes, any cause for concern? Overall they are clearly growing well and so take that to be encouraging but naturally, want to be sure that there is nothing amiss as have not seen this during their time in the UK. 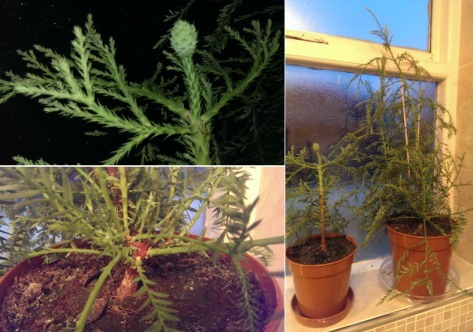 2/ some of the sequoia have an obvious central leader but a couple have 2 or 3 branches seemingly vying for dominance. Does the nature of the growth of the tree mean that this sorts itself out naturally over time and only 1 branch will go on as the leader? 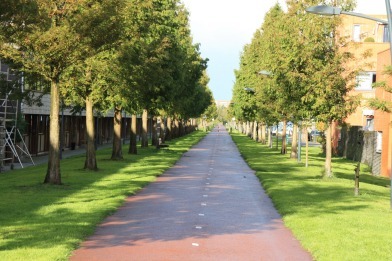 Alternatively, should I take any proactive steps as I would with my deciduous trees by training up a central leader and either tip pruning or remove completely the competing branches? In case you are wondering about the lurid inverted drink container, this is to help us spot where the sequoia have been planted. Whilst they have weed suppression mats under them, once the adjacent vegetation grows they can be difficult to spot. Hence the "Hi Viz" look. This is necessary as we are still felling many trees in the area and as most are over 40m in height, it is good to have a reminder of where they are when we are planning the direction of fall. Ten days ago I went ahead with the transplanting of the seedlings using the suggested spoon method. Overall it seems to have gone reasonably well but over the first 48 hours after the transplant into individual pots, I did lose 5 from those pots where multiple seeds had germinated. After a further week, the remainder seem to have all settled well and are continuing to grow quite speedily as you might be able to make out from the attached photo. 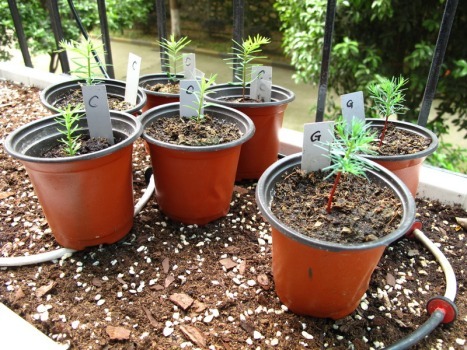 Thanks for the updates Pierre, it's great to have people let us know of their experiments and experiences in growing Redwoods. I am glad most of your small trees appear to have survived and hope they continue to thrive. I look forward to more updates to see how they (and your saplings growing in the Pyrenees) get along. I'm an arborist here in California that is conducting research on albino coast redwoods. I've been able to propagate some of these extremely rare trees. The pictures that I've provided are an example. 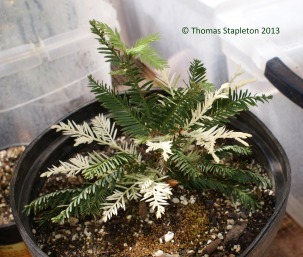 It's pretty humbling to be propagating a redwood where only five are known to exist. Each one of these chimeras are from two different phenotypes. The one that's sectorial chimera grows in a "candy cane" like pattern of white and green on the main stem. The periclinal chimera grows albino white from axillary buds off the main stem. What amazing about chimeric redwoods is they consist of two different genotypes or two sets of DNA. Have you seen any albinism on coast redwoods in the UK? It wouldn't surprise me if there were a few that are on your list. Albinos can be aerial or basal. Here are a few pictures for example. Right now in California the albino count stands around 165 known specimens. That's an extremely unusual past-time you have there Tom! I can't say that I've ever seen anything like this in the U.K. but I will keep my eyes peeled. Tom published his experiment results to his website, the report is titled "Albino Redwoods Point to Resiliency Within The Species ". The photograph is of one of his test subjects. 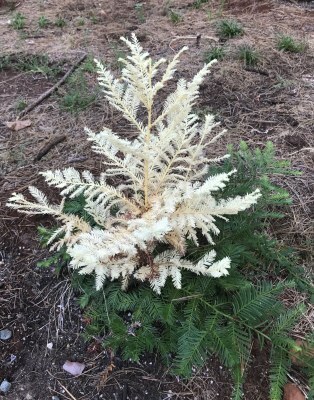 I hope one day that you find an albino redwood on the British Isles. You'll be pleasantly surprised by their beauty. 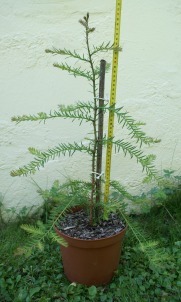 Ten years ago I was given a tiny sapling of a giant redwood in a pot. It was about 15cm tall then, so must have been a few years old already. I kept it indoors for another year or two, in larger pots; then in a large pot on our patio; and finally planted it out in the garden after about 3-4 years. It is now just on 2m tall. We have a 3 acre garden in Surrey with acid soil, and rhododendrons grow well around here. But there are many large trees, mostly oak, chestnut and various pines, and no part of the garden is free of shade all day. Since I could not put the redwood in the middle of the lawn, it had to go in a location which I knew perfectly well had a bit too much shade. Nevertheless, it has grown steadily and well in most years. I have surrounded it with wire netting since some local animals did have a nibble at the lower branches in the first year in the garden soil. I check its growth regularly. When I went to look at it today (April 2nd) I was alarmed to note that many of the needle-branches seem to be going dark brown or black at the tip. This has happened quite recently, because I certainly have checked the tree within the last 2 months. The effect is quite small at first sight, but if you look closely the needles are going dark coloured in many parts of the tree, not just the lowest branches, which I would expect to die of from time to time. Can you tell me if this is a normal stage in spring, or has something like a virus got into the tree, causing a die-back? Is there anything I can do to encourage growth? I know what the new needles look like in summer with the much brighter and lighter green shade. There are no new needles yet, as the spring has been so cold. Do you have any advice? I would appreciate help from someone who understands redwoods. I am sorry to hear about your problems with your Giant Redwood. 1 - It could be that the brief period of warm weather we had earlier in the year encouraged fresh spring growth to begin. The subsequent prolonged period of very cold weather and regular frosts may have damaged the delicate young growth, leading to the possible death and subsequent decay. 2 - The prolonged damp period may have caused some fungal growth on the softer extremities. I did experience some foliage/branchlet loss on some of my young (still potted) saplings last year, owing to the long warm damp period during the first half of last summer, the effect was more typically of browning rather than turning black quite quickly. Clipping away the affected branches to a centimeter into the unaffected portion seemed to resolve the problem, and the eventual arrival of the dry summer seemed to fix the problem. I did spray with a fungicide, but I'm not sure how much effect this may have had. 3 - Compaction of the soil around the tree may be causing it stress, and exacerbating any other problems the tree may have. Try loosening the soil around the tree as wide as the foliage (with a fork, not a spade), and spread a mulch of bark or wood chips. This will help keep the tree in good health. I recommend clipping away any branches to a centimeter into the unaffected area anyway, and check the moisture level of the ground. If the ground is particularly boggy it would probably help the tree if it could be drained a little, at least until it had time to get more established. You could try using an anti-fungal spray, just in case. Once established, these trees are very resilient and should not require any great fussing to keep them happy, other than ensuring the ground is ideal as I mentioned above. It's just a question of getting it through the first couple of years. Some years you may see a higher percentage than normal of browning of foliage (randomly across the tree), but I have seen this occasionally on all sizes of Redwood trees over the years and they have not suffered for it. I clipped back the branches as you suggested, not perhaps as much as 2cm, which would have left it pretty damaged, but a good cm. 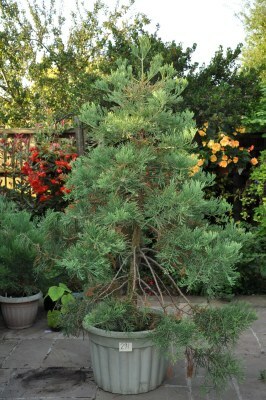 A few months later it is in splendid shape, and is now substantially over 2m tall. Because the picture is from a low angle it is not obvious that the top of the tree is now well above 2m. It has grown a good 10cm this summer, and all the branches have sprouted considerably. It extends far outside the wire cage in several places. 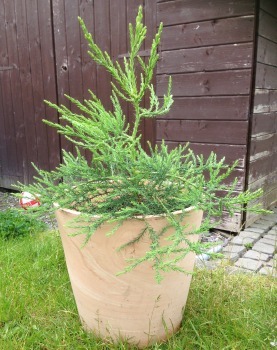 I was given it as a potted plant in 2004, and it was about 15-20cm tall then at most. I am sure you were right that the damage was something to do with the odd sequence of cold, warm, and damp in the spring, that it started to make new shoots, and then got frozen again. All the branches have grown well during the summer, even the lowest ones that I expected to die back as the tree got taller. 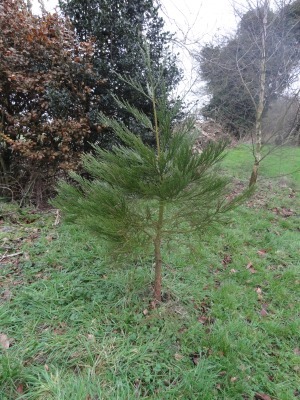 It looks all set to grow into a fine tree now. Many thanks for your help and encouragement. I am really pleased to hear that your Giant Redwood has bounced back to health! They do sometimes seem to suffer when small from the cold dry winter wind and sometimes from a warm, damp start to the year, but as I said it's a question of getting them through the first couple of years with a little care, after that they tend to just get on with it and grow and grow. 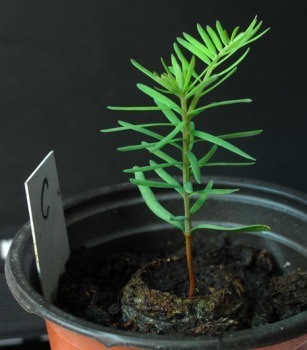 I live in Falmouth, Cornwall and when visiting the Eden project some years ago I saw giant sequoia saplings for sale. I've always had a passion for big plants and love trees so I thought I'd give it a go. It lived in a pot for about 4 years not really going anywhere, only reaching about 8 inches high so in spring 2005. I planted in in the garden more in hope than expectation as I just assumed it wasn't suited to the climate in a seaside Cornish town, but I was apparently wrong! In the first year released into the "wild" it started growing at an astonishing rate and has continued, now standing nearly 18 feet tall. It's growth shows no sign of slowing, each year adding at least 2 feet between mid May and around early October. It's trunk is about 18 inches thick at the base and it has now become quite a feature in my garden! I hope my redwood adventure is of some interest as I'm sure it's a pretty rare tree in this country and I've certainly not seen or heard of any down here. I am always looking for any advice and information on care for these trees as I'd love to see it grow up through future generations as my house gets handed down to the children and beyond. I think growing an interesting or rare tree is a great monument and legacy in any family home. Congratulations on your rocketing redwood! It's always great to see your own trees growing well, even better when it was so unexpected. Yes, you're right it is relatively rare to see these in the U.K., but I have noticed that Cornwall seems to have far fewer than many other counties (one of my favourite parts of Britain). I've always wondered why this might be, because the climate certainly doesn't seem bad for such trees. 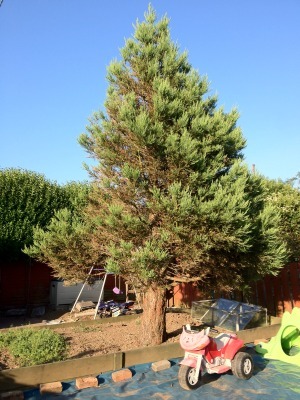 Neal wrote to say that his Giant Redwood after just 10 years is already dwarfing my shed! I'm just pleased I put it a long way from my house! 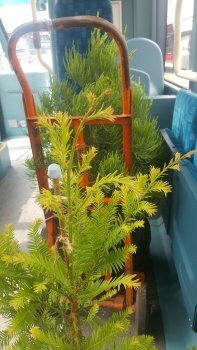 Recently I bought a coast redwood sapling which I hope to put into a free spot outside next summer to complete the pair of Giants. I'm pleased to see that your Giant Redwood is doing so well, it looks really sturdy. I look forward to hearing from you when your Coast Redwood completes your pair of Giant trees. Do you have room for a Dawn Redwood too? It would complete the Redwood set! I've planted a lot of broadleaf tree seeds (can't go wrong really) but never tried any sort of conifer. I collected a bag full of freshly dropped S.g redwood cones with my wife Dawn at Tylney Hall in Hampshire (on satellite Google maps you can see their avenues of redwood by the distinctive shadows) we were there the day after moderate storms 14.2.14. With your guidance I selected the best cones over 2" & dried them in a cool shed in open trays. With no further preparation on 9.4.14 I scattered a couple of hundred seeds on top of normal seed compost & sprinkled perlite on top. The whole lot was kept warm & moist with a plastic propagator lid in an open greenhouse. Now 3 weeks later I have 4 moved into 3" pots and another 10 sprouting. I did lose 1 early on to damping off which annoyed me as you explained how to avoid this! I found they have been ok to move by using a pair of desert spoons to excavate like a cradle without disturbing the roots- not lost any in moving them, even one I slipped & it fell out of the soil exposing the clean white 2cm tap root. I wondered if you'd found the 2013 crop more fertile than usual?! I am very pleased to hear of your success with the seeds that you gathered. I can't say whether 2013 was a good year for the seeds, as I have not been able to put as much time into growing as I would have liked. But you have spurred me on to get hold of some more cones and get some fresh seeds on the go. Li Minghe - May 2014 Li Minghe is a Chinese professor of Central China Agricultural University, Wuhan, P. R. China. Li asked if I had any Coast redwood and Giant redwood seeds and these were posted in January 2013 (I was a little slow at getting them ready) and they were received by him the next month. In May 2014: Tell you the results of seeds you sent to me. The numbers of coast red wood and giant sequoia seeds are 438 and 596, respectively. I put seeds in Petri dishes in my room with temperature of 24 degree centigrade. The germination rate was very low ! 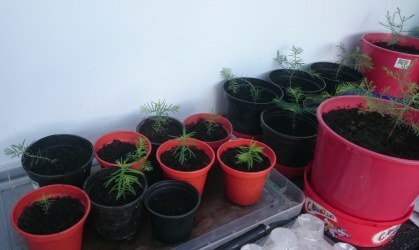 I got only 2 giant and 5 coast redwood seedlings now. Two or three seedlings died after their germination, and one of them might be an albino. Now I am sending you some pictures of these seedlings. 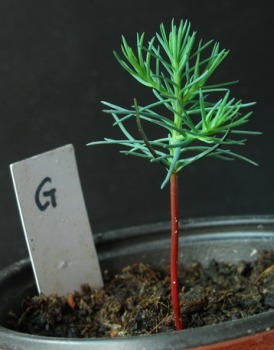 The Ministry of Forestry of China has introduced more than a kilogram coast redwood seeds for me from USA and the seedlings grow very well. 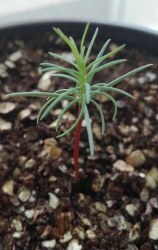 A friend of mine brought me 100 giant sequoia seeds from the USA and I got about 40 seedlings from them. Now I am leaning how to grow coast and giant redwood trees! I want these trees to be planted in more places in China. OK!! I am very happy to have your seeds to begin my research!!! Thank you very much!!! That's great news, I am really pleased you are managing to get some seeds to germinate. It is brilliant! 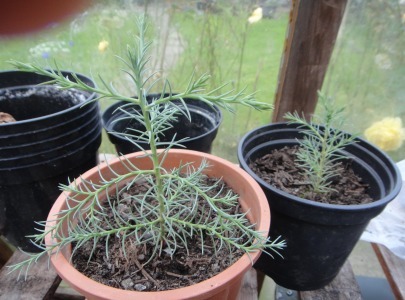 The Giant Redwood seeds I have gathered from trees in England I have found to have a very low germination rate but when I have managed to grow one they have been a really good sapling, a nice shape and full foliage. 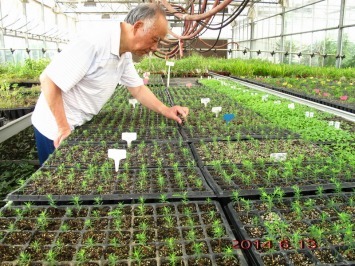 I hope you will find the same, the photographs you sent of the seedlings indicate they are in extremely good health. Very clear photographs, by the way, thank you. I hope your research goes very well and you are able to plant out as many of these trees as possible! 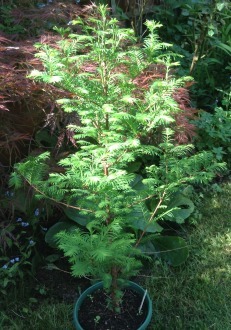 I would like to show you the sequoia I bought from the Eden Project as a sapling when I was about 14 and grew in my parents garden. It is now I would guess about 15 years old, and to my bad calculations maybe 20ft tall. Should I get this tree protected or listed in any way? At what age do the branches begin to thicken and the truck be visible? I've also noticed that spiders love this tree in particular. Thank you for your work in protecting this species. 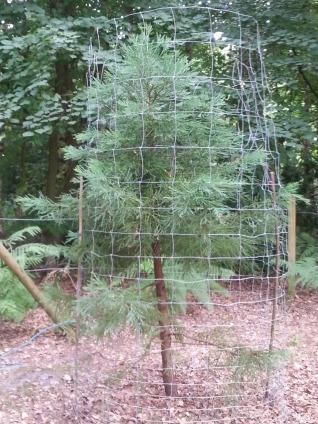 Thank you for sending photographs of your young sequoia, a lovely specimen. I'm really not too sure about when you can protect a tree (whether it is down to age or tallness or unusual nature etc), perhaps the local tree officer could help you with that one. As to the trunk being visible, that is your choice depending on your preference. When they grow altogether in large forests, the lower branches drop automatically so that's when you see their trunks. Some people remove the lowest branches to get just that effect but actually, (when grown as a single specimen tree and without any competition from other trees next to it), the tree is happy to keep them. If you flick through the locations section of the website you will see examples of trees where the lower branches have been retained and the effect is prehistoric looking branches sweeping down to the ground, and other examples where in the past the tree was a little more crowded in its early life and dropped the branches, or people have just cut the lower ones to reveal the trunk, as I mentioned. I hope you get many years enjoyment from your tree. Dawn Redwood December 2012 Chris collected a Dawn Redwood from my house originally in December 2012 to plant on a farm in Warwickshire where they have also planted many fruit trees. He erected a substantial fence, a neccesary precaution as he says because roe deer walk by it most mornings. 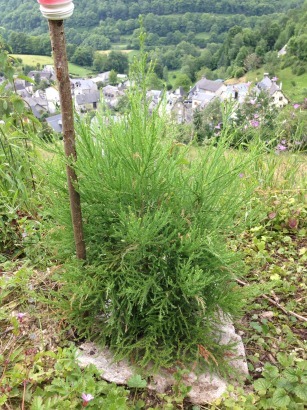 In July 2014 Chris sent an update on the sapling. As you can see it is doing very well. We covered the soil with bark when we planted it, and this helps to keep it moist during the summer as the soil is a heavy red marl. In summer my dad and I gathered cones from the Inchture Giant Redwoods, which are just a few minutes from us down the road. I remember them when I was at Inchture Primary School in the 1970s when they were totally ignored and abandoned, all high grass and no signs or any information about them, although we were told about them by our teacher, a Miss Dobbie, who loved such things. Anyway, as I said, we gathered cones, knocked the seeds into compost and have first had two geminate, (which are about 4 or 5 inched tall now), in a greenhouse in July and then five in September, (which are still small seedlings). It is nice to know that their parents came over as seeds in the Gold Rush! I went to the Tuoleme Grove in the Sierra Nevada, when I was at a krav maga fight school in San Francisco 3 years ago. I remember I craned my neck. We got good info from your website as we weren’t sure how to plant the seeds. Now it’s not hot in the greenhouse I am trying to get my dad not to keep them so damp as I think the roots might rot. If you second that he might keep them drier. 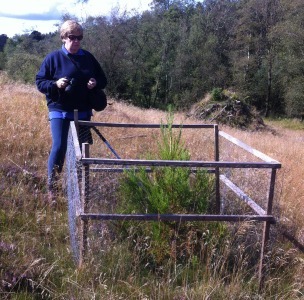 Thanks for the details of your venture with the Inchture trees, and well done for getting so many to germinate. They are not the easiest of trees to grow from seed, and most people have difficulty getting them beyond the the early seedling stage. I used to get quite a few emails from people that lost them in the first few inches of growth, and I had the same problem myself when I started growing them from seed. Hence my guidance on the web site pages. They really do need to be kept a little drier than one would many other plants, continually or very frequently soggy compost will lead to them wilting and dying. Once the wilting starts there is no chance of recovery, they will die. Giant Redwood 2014 I tend to go by the weight of the pot, and for small pots I water from the base of the pot, into the saucer, and discard any excess water that remains after half ten minutes (although I would generally not expect to put in so much that it sits there for that long). It can be a little tricky in the summer because they are growing and you don't want them to sit totally dry for too long, although I suspect that a day or so of great dryness is beneficial provided they are not in direct summer sunlight. Like all plants, they need some moisture at least for most of the time. The other thing to do to help them is to ensure there is reasonable ventilation in the greenhouse over the winter. A very damp environment and stagnant air will also lead to a fungal or bacterial attack on the foliage (I think the former, but I am not sure at the moment - still learning!). It seems odd that a tree that is so sturdy and seemingly invincible as a mature tree can be so fragile as a seedling, but that seems to be their way. You might notice that you will never see any naturally-seeded saplings growing around these trees in the UK, they seem to need the ideal conditions that occur in the forests of their last natural habitat, and of course the many millions of seeds that are released after a small forest-fire has swept through. They are so long-lived that they do not need a high rate of reproduction, I suppose. I grew this from seed, it sprouted in Spring 2014 in Ipswich, Suffolk, at my girlfriends house outside in a shady pot. I brought it to my house in Whitstable, Kent, re-potted it and have had it sitting in the south facing window of my living room. The seedling growth seems to have stalled and it seems a bit pale, do you have any advice. Congratulations on growing a fine young specimen of a Giant Redwood! You have got it past the most difficult stage but I would say that the compost looks a too soggy. They really don't like to sit in damp soil in pots (although seem to cope with it a bit better when they are planted out), so I would ease up in the watering. Apart from that, the growth will stall now (even indoors) during the winter period, but come spring it should start to put out new growth. At that size there is a risk of frost damage if they are left outside in the winter, but on the other hand they are a temperate climate tree so warm humid living room might not be the best location. Ideally an unheated greenhouse would be the best choice, but in the absence of this it might be best if you could find a cooler part of the house for its first winter (especially if you like having your central heating up fairly high!). Good air circulation also helps to stave off bacterial and mould attack. 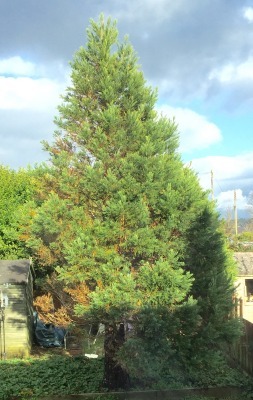 This is one of my giant redwoods, it is about 3 years old grown from the seed, I want to pot it on to a larger tub, could you recommend a compost type soil please. I am also trying some ashes off a wood fire to copy woodland fires as Ihave read that they benefit from the ashes (time will tell). I actually have about 15 which I started from seed in chinese cartons covered in a plastic bag on a sunny window ledge. It worked for me. I also started to grow bristlecone pines and number of oak trees which I am sure will be beautiful in a couple of hundred years time. 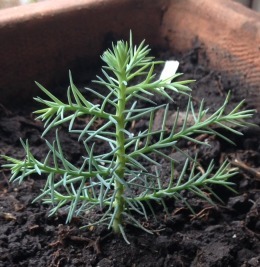 Giant Redwood June 2015 Congratulations on growing your redwood saplings from seed, I know how difficult this can be and have had plenty of emails from people despairing that they've been unsuccessful in their attempts. 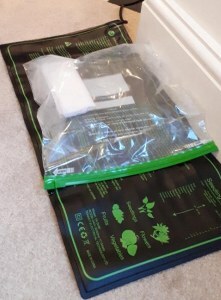 The type of compost I use is a general purpose compost, often the large (120 litre) bags sold by Homebase. This seems to be the most economical source and the compost does seem to be a nice quality and consistency. Being conscious of the fact that they like a more mineralised soil and good drainage, I usually mix in some horticultural sand and/or fine top soil. Usually about 80% compost in this mix. Lately I've also been adding some well rotted horse manure, just a little, in the hope that this will provide nutrients in the longer term. I've only been doing this for a year of so but so far they seem to be doing well. I tried chicken manure pellets but I have a feeling that it had a detrimental effect on the saplings. Another point, when I'm re-potting the larger saplings I tend to throw the compost from failed sowing attempts into the mix, as this is often a sandy mixture. It is possible they might prefer ericaceous compost, I tried using this wholly or in parts years ago but I can't recall it being any more successful and it did work out rather expensive given the number and size of saplings I was re-potting. Basically, redwoods will grow in almost any compost as long as it's not too soggy (although the Dawn Redwood is quite content with excess moisture). On the subject of using ashes in the mixture, I think this is worth trying but I would restrict it a small number to start with as an experiment. I believe ashes will have the effect of moving the ph of the soil towards aklaine, and pine trees probably prefer a more acidic soil. I tried using ash at the seed sowing stage some years ago but can't recall my brief experiment being any more successful. Good luck with your propagating and I'd be pleased to hear an update on your tree growing in the future. 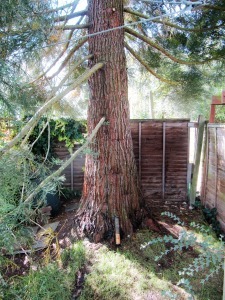 We have a large Giant Redwood in our garden in Leamington Spa. I collected many seeds in May this year and planted them (a bit willy nilly) in two propagating trays. One I left outside and the other I placed on a shaded window sill indoors. Only two seeds germinated (from the inside tray) which I quickly took outside to enjoy the better weather. One seedling died but the other is now about 4/5 inches high and looks incredibly healthy (touch wood). I repotted it yesterday which was a bit nerve wracking but the result looks good. I used a mixture of soil from underneath the existing redwood and coarse compost. 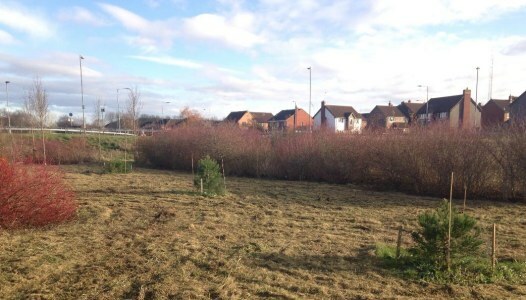 The plan is to plant it in a year or so in good spot in the countryside, possibly next to a footpath/bridle way. Already my two young boys are sourcing "good survival potential" spots. 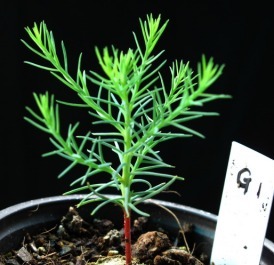 Giant Redwood August 2015 Congratulations on growing a Giant Redwood, they are not easy to germinate and keep alive while they are tiny seedlings so you have done very well. I hope you manage to find an appropriate site to plant it. I like to return to my plantings over the years and see how they are progressing, so I expect you and your boys will do the same if yours survives to planting out stage. Good luck and I look forward to any updates. 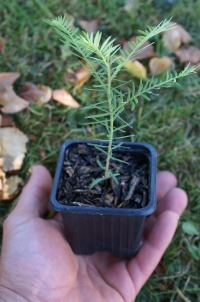 I have 10 small Giant Redwoods that I planted earlier this year. One of them is actually from a seed I got from a cone from Lunds botanical Garden in Sweden, where I live. They are all between 5-10 centimeters (2-4 inches) tall and I wonder how I should treat them during the winter? I live in an apartment, but I have a small balcony if they need colder winters than indoor temperature (however the swedish winters can be cold...). I also have a small "plant Light" in case they would need more light during the winter. Giant Redwood November 2015 Giant Redwoods are a temperate climate tree and therefore generally favour a cool winter period each year. Keeping them in a warm environment prevents them having this cool period and, although I'm not certain how detrimental this is to a temperate climate tree, the other factor to consider is that a warm moist indoor atmosphere during the winter with very little air flow might encourage pathogens such as fungal growths. They are quite a disease resistant tree but I generally advise people to move them to a cooler conservatory or greenhouse for the winter period, but avoiding frost conditions while it is so tender. This is obviously a bit tricky given how cold your winters get and that you only have a balcony and but I wonder whether you could make a ventilated cold frame for your balcony. I have found that when they are that tiny they really don't like being frozen so you might be wise to perhaps keep some indoors in a light and airy place that is maybe a little cooler than the rest of the apartment but I realise this might be difficult to find. For the ones you keep indoors, it might be advantageous to have a fan gently blowing across them several times a day to help avoid stagnation and mould. 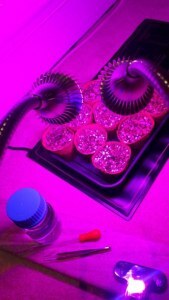 The plant light might also help, and remember that they don't like being too soggy. Good luck. I bought my tree from the visitor centre at Redwood National Park for the princely sum of $4.95 in June 1998. 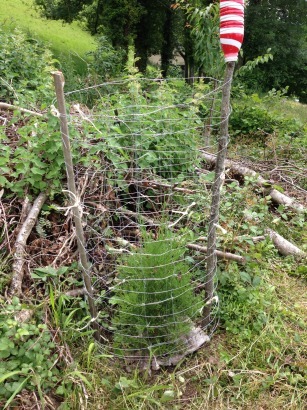 If you look at the first picture, the plastic tube resting at the base of the trunk was the container for the tree seedling when purchased and was produced by The Jonsteen Company of McKinleyville CA which is just south of Redwood NP. The tube measures 12” long & 2” diameter. 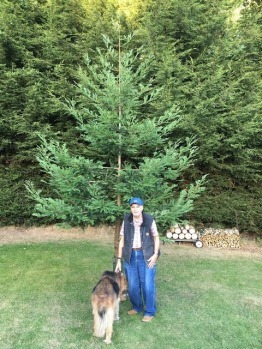 Giant Redwood December 2015 When I got it home I grew it on in ever bigger flower pots and planted it out in the garden in April 2000 when it was about 18” tall. It was quite amazing you could almost watch it grow – I certainly didn’t give it any feed!! The 2nd picture shows how the branches are all heading vertically even the ones right up the top. Why it does this I have no idea, it’s not like it’s having to compete for sunlight. For some reason the top of the tree bends to the left & right after its growing season hence the trunk is a bit wavy but as its diameter increases this gets hidden. Currently the girth is 1.8 metres measured 1.5 metres from the ground. Unlike other giant sequoias I’ve seen the new foliage takes on an almost turquoise colour not like the normal dark green. Because of its location in a pocket handkerchief of a back garden surrounded by other properties it’s almost impossible to gauge its height. The tree picture was taken through the window of my back bedroom hence the cloudiness. Again unlike other sequoias I get the “tiny christmas tree” effect right at the top which is that year’s new vertical growth. I can see what you mean about the branches pointing upwards, this tree shows something similar. I'm not familiar with the different varieties though so I am unable to advise if this is the reason for it, I will say I have noticed a similar effect on very large trees where the lower branches sweep down and then point straight up again. Joan wrote to say that she has a grandson who is obsessed with Redwoods and she wanted to get him one for his birthday. A few weeks later she wrote to say, I thought I would send you a photo of Sid with his Redwood tree. He was so pleased, he couldn't believe it, - he loves it. That's really terrific, I'm so glad he was pleased with his new tree. A school friend gave Sid a book called Redwoods by Jason Chin. ISBN 978-250-06269-7. It's a really informative and well illustrated book. I thought if you ever have anybody buying a Redwood for a child it's a great accompaniment. It shows you how much Sid talks about Redwoods that a friend bought him that book without any idea that he was getting one of his own! 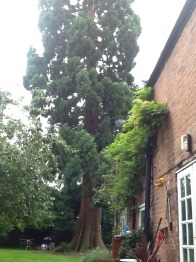 He was amazed that he also has a Dawn Redwood, so thank you very much for all your help. I ordered a copy of the Jason Chin book to see for myself and found it a real gem, full of details on Coast Redwoods that make them so unusual and distinctive. 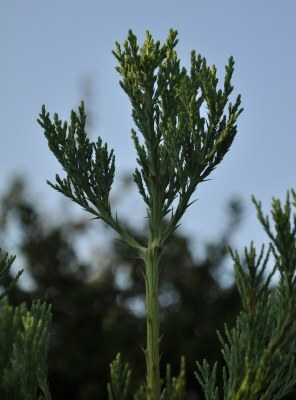 Although the foliage on the Coast Redwood is different to the the Giant Redwood, they share most of the traits that are described in the book. I will be recommending it when I speak to anyone with a youngster having an interest in Redwoods. 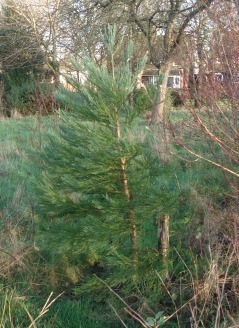 Good luck with your tree, I hope it (and the Dawn Redwood) brings Sid lots of joy, do let me know how you get on. "We remember you saying the trees could do with a feed in the spring but cannot remember what we had to give them. They seem to be thriving. I have attached a couple of photos. The Dawn redwood is fantastic with its new growth. Sid loves his trees and on any journey constantly looking out for Redwoods!" The feed I mentioned would have been something like Phostrogen, but I also apply a dose of sequested iron once a year or so. The later comes in small sachets from most garden centres, they don't all stock it. I tend to apply the Phostrogen feed once every week or two, and the sequestered iron I might do twice a year, one in spring, one in summer. I'm glad Sid loves his trees and is still looking out for them on journeys! His own trees are looking in really good shape so you've obviously been looking after them well. Coast Redwood January 2016 This is a picture of my coastal, it can't be older than 3years at the most it's only 2 foot high and I believe this is a flower. Is this a flower do you think or some sort of parasite/fungal infection? It's been grown in a greenhouse most of its life and it's been through some rough times. Maybe it's rebelling as it's young and naive? Anyway any info would be much appreciated. Your website helped a lot and I bought my first sapling and I've germinated upwards of 20 wellingtons last year which I only have three left, the fungus got them (my bad, poor air circulation and too much sun) lessons learned. 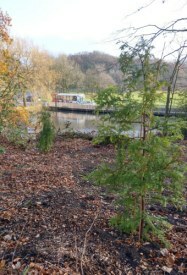 Also tricked some coastal redwoods into germinating on the 20th of January, they'll be annoyed to find out they're in Cumbria and not California. Don't worry, Angus, it is a male flower/cone not a disease or fungus. You mentioned that the sapling has been stressed and I have noticed over the years that young trees that experience drought or suffer in some way often throw out cones, almost as a last ditch effort to reproduce before dying, even if it is far too early for the cones to produce viable seeds. However, don't worry (again) because all of the trees I've had that did this have recovered and are continuing to grow well now. 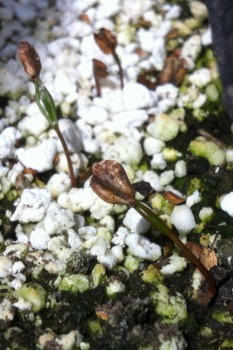 Congratulations on germinating your Wellingtionias, the hardest of all the Redwoods to grow in my experience. Three is good for a first time batch. I'm glad the website helped. 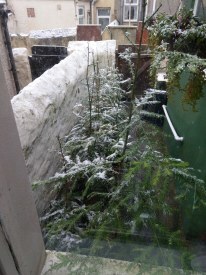 Yes, I expect your Coast Redwoods will survive the shock of awaking to a Cumbrian winter! 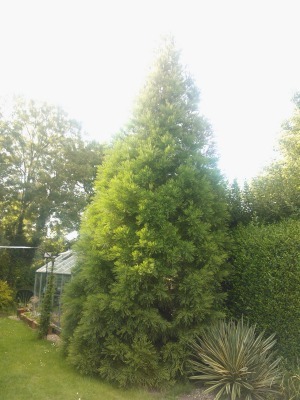 Giant Redwood October 2014 David bought a young Sequoiadendron giganteum (0.6 metres high) as a future specimen tree to mark his sister's ruby wedding anniversary back in 2012 and it was planted out in early 2013. October 2014 I thought that you might perhaps be interested to see how it’s doing. Needless to say, we’re all absolutely delighted. June 2016 My sister has sent me another picture, taken today, of her ruby wedding anniversary Sequoiadendron. I think there’s no doubt that your efforts in raising that particular specimen have been well rewarded! I'm very pleased it is doing so well, it has obviously benefited from your sister's care. It was quite young when planted out but now it is established you should find it will put on even more rapid growth in future years. Harry - July 2016 This Giant Redwood had a long journey, in various modes of transport, to its final destination. 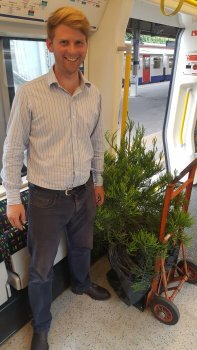 After Sapling 429 was delivered in July 2016 to Romford, I hailed a black cab who drove me to Elm Park station (he said it was nearer than Upminster). I travelled by tube to Putney, the other side of London, then drove it up to the Highlands of Scotland. It is doing well in its first year! I believe this must be one of the most travelled of our saplings! 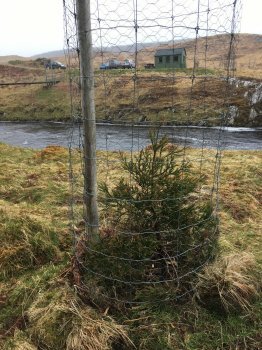 The tree should do well in Scotland, they seem to thrive there, I expect the weather and the soil must suit them. I'm sure it will be very happy in its new home and hope it gives you much pleasure each year on your fishing trips. 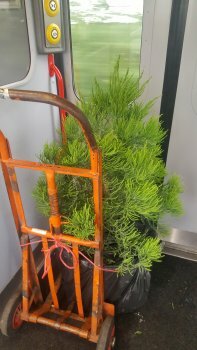 Harry went one better this year, by taking two trees on a journey from Essex and across London by bus, train and tube. Quite a feat! Your journey reminds me of the lead character's trip to his new job location in the film "Hot Fuzz", when he is carrying his Peace Lily. Comedy Gold! 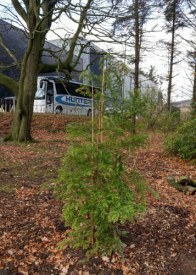 The well-travelled Giant and Coast Redwood trees are also to be planted in Scotland. 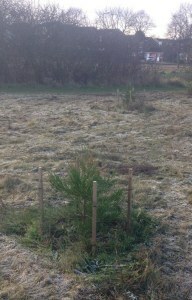 The start of Harry's future Caledonian Redwood Forest! Harry wrote to say that he and his partner had been on a trip to the U.S.A including through Sequoia National Park. We stayed in Mineral King for a few days and went on a 4 hour hike up to Paradise Ridge. We also visited the General Sherman and General Grant trees. Below San Francisco we saw some very tall and wide coast redwoods. 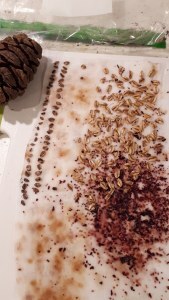 I tried unsuccessfully to germinate some giant sequoia seeds on the heat mat and wet muslin in food bag. At the same time I put some in the fridge in wet muslin in a food container which I took out after three weeks and scattered on biodegradable pots filled with vermiculite, perlite and sheeps wool compost. Nothing happened and I started to see some mould over them. I put them by the back window and went skiing with Jess expecting to come back to the dried out remains. Instead 6 had germinated! I’ve been caring for them since and I’m delighted with how they are coming on! There is no sign of mould. What fantastic tales - both of your terrific holiday and of your successful growing exploits! Harry is now also experimenting with a grow light and has more seeds in the fridge going through the stratification process. 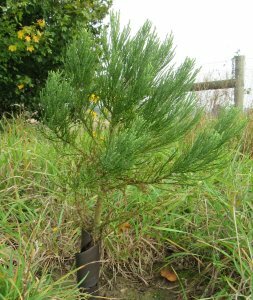 Coast Redwood September 2016 My passion is forest research regeneration and forest nursery. I have been a huge fan of sequoia forestry since 5 years. Recently I read your website, it's very nice to share such stories about sequoia. 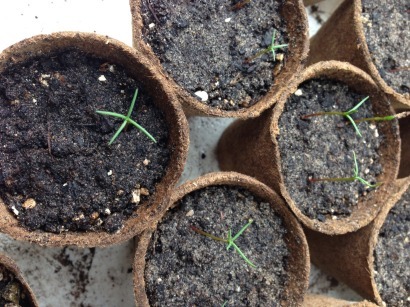 Last year I have been growing in biological way, giant and sempervirens sequoia seedlings from seeds. I try to get interest people in growing such trees in their fields, but it's still very slow to get them enthusiastic about it. I was wondering if you need seedlings for your own projects or for customers, (for example English people who live in Normandy, never knows). 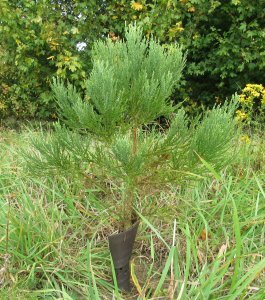 I would like also to make an inventory of the sequoias and their growing rate in Normandy. It would be interesting. If anyone living Normandy would like one of Samuel's trees please contact us and your details will be passed to him to make contact. Giant Redwood Late 2015 I started growing my Giant Redwoods a year ago and since then have been following your website closely. I planted 90 seeds in July 2015 with the first seedlings starting to germinate after a month. Seeds were sown in two large seedling trays and buried around a centimetre into regular compost. Over the following weeks I was surprised to see around 30% of the seeds germinate. I thought this number would be a lot smaller given Giant Redwoods notoriously low germination rates. However, following germination many seedlings succumbed to overly wet or dry conditions- I found it very hard to maintain good growing conditions during these early stages. As of July 2016, five seedlings have survived to reach their first birthday. They now occupy larger pots to encourage growth and they are now based outside permanently. I now hope to be equally successful with Coast Redwoods in the coming spring 2017. Congratulations on germinating and growing your five seedlings, as you say they can be hard to cultivate because of the difficulty getting the conditions just right. In my experience, five is a very respectable amount to achieve out of 90 seeds and 30% germination rate was excellent. 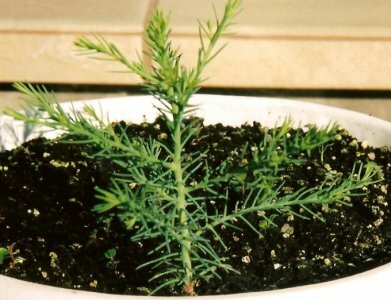 You should find Coast Redwood are much more resilient at the seedling stage and it's harder to kill them through over-watering. 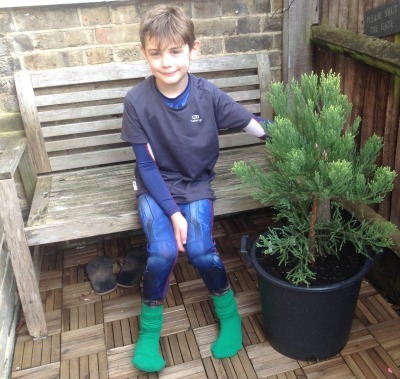 Giant Redwood 2014 James first contacted us in 2014 and the Giant Redwood he chose was grown from a seed from the Upminster Windmill tree. The few saplings I have managed to grow from this tree have turned into really good specimens so I hope this one does too. In 2016 we heard again from James: After a slow start last year (I should have watered) the Giant Redwood really got its feet down this year. It has grown almost half a metre in our heavy boulder clay soil and is looking very healthy. 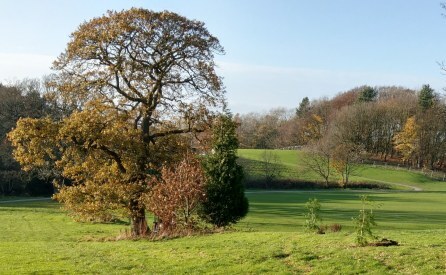 I had a look at its parent on your site, it has added a new dimension to our enjoyment of our tree. My coast redwoods that I grew from seed have had a few ups and downs. I kept them inside a little too long this spring and it started to check them, then the week I did put them out we had those late frosts. My asparagus plants have shaded them a bit this summer. However I have more than enough fine specimens remaining the best is now 1.3m tall. The whips that I purchased are romping away 2+ metres. I will keep you informed from time to time, with good news hopefully. It's good to hear that all your trees are doing well, apart from slight setbacks. The Giant should should really start racing away now. Watering during the summer in the first year or two after planting is probably wise. In my experience the Coasts are the most forgiving of the Redwoods, in that they will grow from the base if a disaster affects them such as the one in the picture on the right that I planted. I was disappointed to see that it had been very badly scorched from a surrounding grass fire but then noticed it has thrown up fresh young growth at its base! Thanks for letting me know how the Giant Redwood is getting on and I look forward to receiving updates on all your Redwoods in the future. Giant Redwood 2016 Steve's neighbour Bob kindly sent these photographs of Steve's redwoods, giant & coast, respectively. To give some idea of the size, I'm about 5'.8". These were planted in my Barnet garden in 2012 from pot grown cuttings. Steve also offered some kind advice to re-pot regularly, or at least move your pots around a little now and then! Although it has probably been said many times in many ways but anyway here's another reminder: Don't leave your tree for too long, before potting-on or planting out. I recently decided to plant out a long overdue coast redwood that had been happily growing in a succession of pots and had attained the lofty heights on some 5-6 feet. 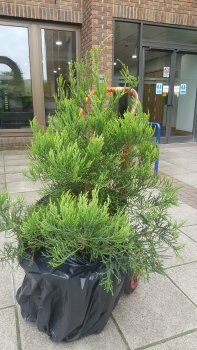 When I tried to pick up the pot and free the tree from its plastic pot, I found that it had become well and truly anchored to the ground, the boot-lace thick roots had grown down through the block-paving, where it had been stood for about a year or so. It started me thinking "would it have continued to grow if it was just left there ?" Giant Redwood 2000 On a visit to the U.K. 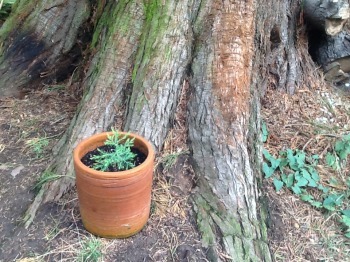 I collected some Giant Redwood cones and I am trying to grow own tree. From all those seeds I sowed in year 2000 I only gained one seedling. I live in Warsaw which is located in the middle of the country so planting Giant Redwood is very difficult due to the severe climate. I decided to plant my tree in the city in a small garden in front of my house. Of course this is not a perfect place for such a big tree but the location between houses guarantees that during winter, the cold wind is less of a danger for the tree compared to the open place. Even in this location after cold winters I have found some damage on my Giant Redwood but the tree can recover this damage during the summer. Currently my Giant Redwood is over 10 metres high. I hope that due to global warming effect which is also strongly visible in Poland this tree will live much longer than I will. Your tree looks really healthy, congratulations on doing so well, a lot of people have great difficulty growing them from seed so you've done a great job. Let's hope that the global warming is in your tree's favour over the coming years! Giant Redwood September 2017 The reason for planting our little Redwood is that when our son Cass was 10 yrs old he found a photo in a book of a giant redwood tree and became very interested in them, we were living in a tiny bungalow with a tiny garden at the time but then my wife's parents gave us the barn next to their house to turn into a house, we also managed to buy a strip of empty farmland off the next door farmer, we lived in a mobile home on the piece of land for a year while building the house, during which time we started planting trees, and for Cass's 11th birthday we were able to buy him a tiny giant redwood (approx 10 inches tall) which he planted at the end of the piece of land. It is doing well despite being a little neglected while we finished the house and work on the rest of the land (now garden) Cass is a couple of years older now and being a teenager is not so interested. However being so young when he planted his tree, if we are able to stay here long tern he will be able to see his tree grow up with him and eventually get much bigger than him and I am sure his interest will come back. A great story Mark. 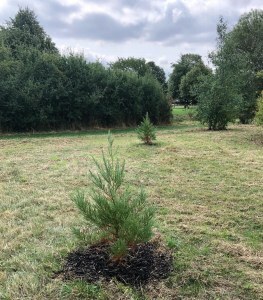 There's been a few young lads written to the website over the years with an interest in these trees, one in particular was very active down in Surrey and sent details of many trees with the help of his friends. Naturally as he grew into his mid-teens he lost interest but I don't doubt as an adult his interest is likely to return. 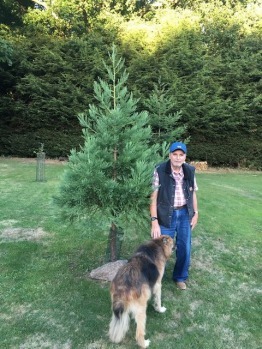 Michael Fennell - November 2017 "I have long wanted to plant a specimen tree for future generations." Michael first wrote to Redwood World in January 2016. Originally, as an amateur boatbuilder, I was in love with the New Zealand Kauri. I did correspond with a forestry museum curator in NZ and heard about a couple of trees in the UK but they were well south and west, and growing extremely slowly. I abandoned the idea as unworkable. 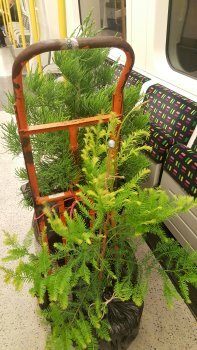 The Dawn Redwood - I first came across them on your site - looks like a much more practical choice. We live near Colchester at an elevation of only 8 metres above sea level. The water table is high and puddles form at any time of the year when there is any spell of rain. The terrain to the North, East and West rises gradually so we are at the lowest point of a natural drainage basin. From here it runs off into Salcott Creek. There is a network of substantial ditches that drain the basin and one such runs past the house. It never seems to dry out in the summer and during the winter is often a torrent. 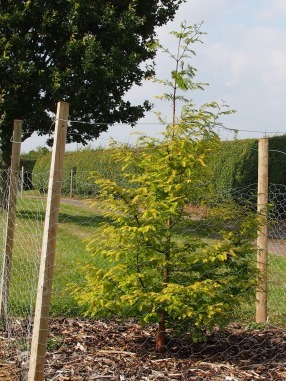 The Dawn Redwood is definitely the best choice for a damp site. They seem very similar to the Swamp Cypress - a tree that often grows in ponds and swamps with their roots continually in water. The Dawn Redwood however is keen on damp conditions but I am not certain it would want to be submerged for very long periods. Swampy or boggy conditions are certainly fine though. It's difficult to know what to advise in these circumstances as I am not certain how much bogginess the tree with stand over a long period, I can usually advise with more certainty in the case of the Coast and Giant Redwood as I am more sure of their limitations in this respect. I understand your position, and I think I have enough info to make a decision. In a way, the site has selected itself being the best compromise in restricted circumstances. It will be 4 or 5ft away from the edge of the ditch where the ground slopes down. I think this will actually improve drainage - I looked at the Soilscape site which said drainage generally is impeded - which I knew from observation. It also said the soil is slightly acidic and moderately fertile. Our basin location concentrates the rainfall run-off making the micro-climate wetter than the East Coast generally. I am prepared to provide watering if a really dry spell comes along. So the tree will be near the centre of a 40ft x 40ft patch with a road along the Eastern border. There is an oak in the SW corner which will shade it but the rest of the compass will allow direct sun. If summer conditions on the East Coast make it dry. I planted the Dawn Redwood a week ago. I had the soil analysed by the RHS and it got a fairly good write-up. Acidity - slightly alkaline at 7.3 pH. 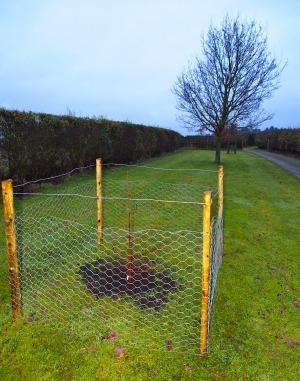 I therefore treated the tree site with sulphur to make it more acid. The sapling was pot-bound, as indicated by roots trying to escape in all directions. The RHS suggest gently prising the root bole before planting but I found the roots too easily broken for that to be successful, so I just planted it as-is. I have built a rabbit guard, and provided some support against the force of the wind in an exposed situation. I will be watering regularly, and keeping my fingers crossed! It's intriguing about treating the soil with sulphur, I'll have to look that up, perhaps it's something I can consider for my own plantings. I think you were wise not to break too many of the roots, they will grow outward anyway in good damp soil. Well done for building the rabbit guard and the support, it sounds as though you're giving it the best chance of thriving. I got my information about acidifying the soil with sulphur from the RHS website. It gets converted slowly to sulphuric acid by soil bacteria. One of the Dawn Redwood American websites you mention gave me the info about them thriving best with an acid pH of about 5. Quite acid in fact and may be difficult to achieve consistently. 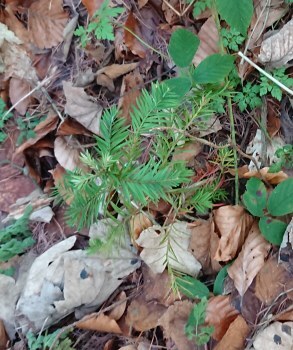 The Dawn Redwood sapling I bought from you last year was planted out in March 2016. Its height was 6'6". I was watering it very regularly - a Treegator device that delivers 15 gallons over about 6 hours. I also added sulphur to the soil twice in the growing season. It reached a height of almost 9' in its first season and was starting to form buds again in late January. Sounds very good to me, what do you think? It's very good to hear that your Dawn Redwood is doing so well. Brilliantly well, I would say. I guess that is testament to your planning, preparation and care. Thanks for letting me know, it's always good to hear about the youngsters settling in and growing up! In summary, I originally started growing Redwoods after my mother died due to cancer. After her death I wanted to do something in her memory. After a lot of thinking I came to the decision that growing a tree from seed would be the best idea. 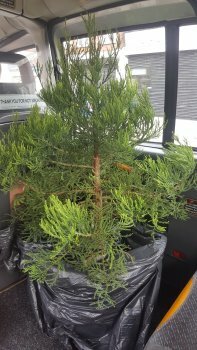 I chose the Giant Redwood, not only because I believe it's a beautiful tree, but mainly the decision was influenced by how difficult it is to kill a Redwood (tolerant against pests etc) plus how incredible long they can live. My first two efforts growing a tree from seeds failed. I was able to get some seeds to germinate, but lost all within the first couple of months (on my first effort I lost about nine from one overwatering incident!). I was successful on my third effort and managed to have three Giant Redwoods make it past a year. I had them indoors next to a window until they were more than 20cm tall, then at the start of Spring they were potted up and transferred outside into my garden. I left them in my garden for a year until planting them out in the following March, so they were in the ground ready for Spring. The biggest mistake I made was giving them a guard which was too tight. I did not realise to begin with, but the branches had covered over the central growth/trunk/leader. The branches were taking all the sunlight & flourished. However they actually had prevented any upward growth from the central growth/leader. I noticed this in July, removing the guards straight away. This had given them all an un-Giant Redwood shape due to them not gaining any more height but their branches had grown thick & wide. It took until the following year before they regained a good shape. I've always used a general all purpose plant feed (Phostrogen) and they've always seemed to flourish so I've never felt the need to change it. When I planted them in the ground I decided to help them the best I can to develop their roots. To do this I wanted to water them frequently for the first two years. In the first year I'd water them everyday it did not rain (some days I couldn't due to commitments), if it rained I would not water them on that day or the day after. Once a week I'd water them using plant feed. I watered them Spring & Summer then stopped. On the second year I lowered the amount I watered them to a maximum of three times a week (one of these I'd water with plant feed). However during the second year there was a lot of rain, so I didn't need to water anywhere near 3 times a week. I only needed to water them eight times in total in both August and September. My intention now is to stop watering them, only intervening if it's a very dry summer. But I'm hoping their roots are easily developed enough to cope on their own from this point on. This year I've planted a further two Giant Redwoods and two Coastal Redwoods. 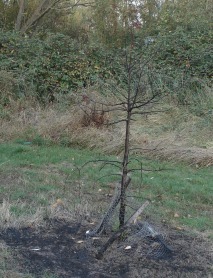 Good news about your saplings, they've certainly started settling in. Carry on Planting, you're part of a group of people creating something brilliant for this and for future generations. Matt wrote to say that a couple of his Giant Redwood trees had been lost to the council mower, and a Coast Redwood had been damaged. What bad luck. Having been with him from the start, when he first wrote to me nearly four years ago about his attempts at getting them to germinate, I also feel very disappointed for him. This has happened to me several times and I know how annoying and frustrating it can be, especially having nurtured a seedling/sapling over many years. His remaining Redwoods though look very healthy so hoping that the next council mower person looks where they are going next time. I am very interested in planting a giant redwood. It is something I have given lengthy thought to. When would be the best time to plant her out? I have a perfect spot in the middle of a 2 acre field so she can grow and breath and no nearby trees of any significent size. 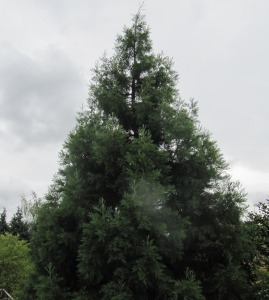 The location you have chosen sounds perfect for a Giant Redwood, with plenty of space as you described it will become a really nice specimen tree. The best time to plant out any tree depends on whether it is going to have a reasonable chance of getting the water it needs during the first year. Because of this, the traditional time to plant trees is early Autumn through to winter (provided the ground is not too frozen). 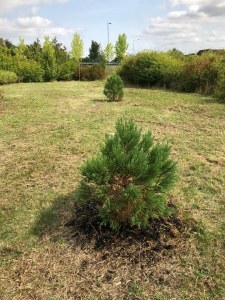 It is quite ok to plant trees at other times, but you will need to water it during the dry summer periods because it will not have had the opportunity to establish its roots sufficiently to ensure a good supply of water. This is particularly important during the type of weather we have had lately, with many weeks at a time with little or no rainfall. A tree planted during the current heatwave will need to be watered with almost the same frequency as if it were still in the pot - i.e. at least every second day, and daily if possible. The soil is clay based and drains well. In the years I have been here its only flooded once over winter and that was this year, so I will keep an eye on the watering. 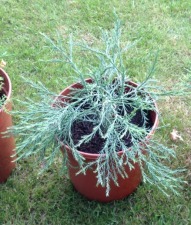 The ground sounds fine, I have a number of these I have planted in clay soil in Essex, and they are doing really well. The occasional flooding does not seem to harm them, although as you know permanent water-logging is not good. The tree is located at co-ordinates N52.8834636, W0.0870964 within Sutterton dog park in Boston Lincolnshire. 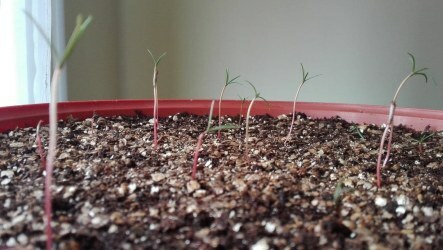 Giant Redwood seedlings January 2019 I just recently discovered your website. It inspired me to try my luck growing Giant Redwood. So I purchased about 40 pcs of S. Giganteum seeds from ebay. To my surprise, plenty of them germinated after one month of stratification in the fridge. Since I don't have growing lights, all the light they get is through the window in my room. I hope they will survive until spring so I can place them outside separately in pots. I live in Hungary by the way. There are a few pretty big Giant Sequoias in my country as well. It was great to hear that the website inspired you to have a go at growing Giant Redwood and marvellous that you've had such success. The tricky part is keeping them going now, not over watering or under watering. Dave originally wrote back in July 2017 having sown seeds in March 2016 he got ten survivors from about two dozen saplings, two of which I gave away and are still alive. After the first summer all eight went into buckets and by May this year two of them were over 3' tall. At this point I planted them out down my local wood. Two months later and three are dead and the rest don't look too clever but are still alive. The thing is that the bigger ones don't seem to be able to support their own weight and I have them propped up with branches. Any ideas why this is so Also this year's crop of redwoods are displaying similar tendencies. 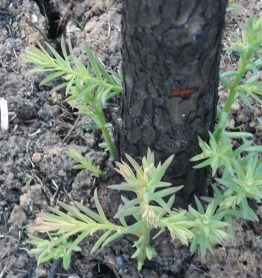 Also this year my sequoia have survived (so far) and are looking much sturdier. I think from now on its sequoia only for me. 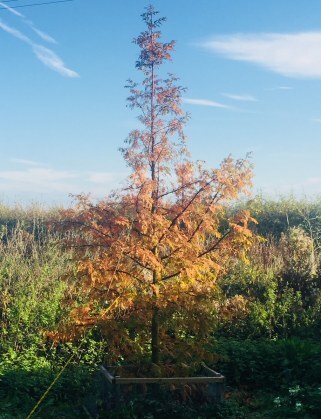 There are two observations I would like to make about your Coast Redwood, firstly that the Coast Redwood doesn't like running dry at all, so if it's planted out in May it will struggle during the first summer without regular watering. In many locations, even if it were planted during late autumn, it would also need some watering during hot periods in the following summer. 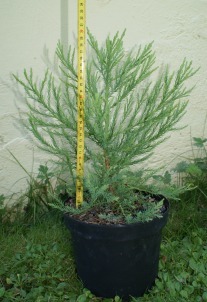 Secondly, Coast Redwood I normally plant out when they are rather larger than the size of yours, and somewhat sturdier. I would have them in a good sized pot, say 20-30 litres and plant them when they were nearer six feet tall, and the stem would look more like the stem of a tree. As for the flopping over, I often get this with my potted saplings as they grow. Sometimes I think they just grow too fast and don't harden up, other times fierce winds during the growing season can just leave them bent over or just out of shape. I fix this by pushing a cane in to the soil, close to the stem, and tying the tree to the cane at several points to straighten it. Several months later it will have hardened off and they can be removed leaving the stem nice and straight. 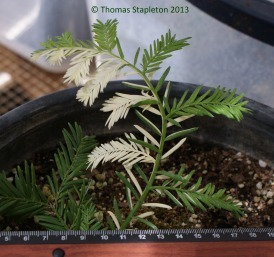 Don't give up on your Coast Redwood saplings, they may yet come good. 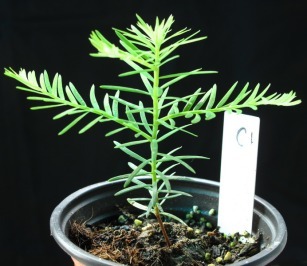 Many years ago, one of my earliest plantings was a scrappy little Coast Redwood only a foot or so high that I planted in woodland thinking it would probably just die. I returned some time later to find it had survived and had two straggly stems leaning over. I cut off one of the stems, found a discarded stick and propped up the remaining stem, again thinking it will amount to nothing but what the heck. Now, some thirteen years later, it's one of the best trees I've planted! It's lush, straight and growing vigorously and the stem was 0.66 metres girth in 2016. Dave wrote again in January 2019 to say that Last Christmas I planted out a total of 23 seedlings. Over a year later I've been able to find TEN survivors, two sequoia the rest redwood. 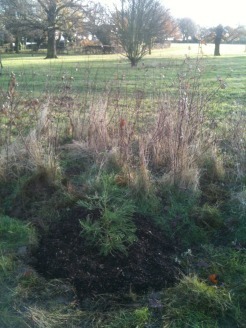 This Christmas I planted 7 sequoia. It was really nice to hear your success story. You have been very lucky to have such young saplings survive out of their own. I usually keep mine in pots until at least two or three years old. I hope they continue to thrive and make interesting additions to the woodland.